Where Do You Fit In? 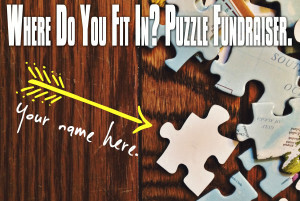 Puzzle Fundraiser. Your first cries never graced my ears. at the glorious sight of your first smile. A world away from me, you walked so tall. Those first steps over red dirt kicking dust. Your blood is in that ground sweet child. The portrait of your life contains that mud. your laughter gripped all those you knew. more prevalent than all but grace. this Love outlasting every other face. And yours lights up the sky. Up child, Don’t linger. Grow up taller. They’re gone but courage roots down deep inside. Survival is elusive and a gift. through storms and tears while heaven’s fire makes gold. Refined you’ll be and precious in His sight. walk tall as Love makes straight the crooked path. As long as breath is in my lungs, fear not. 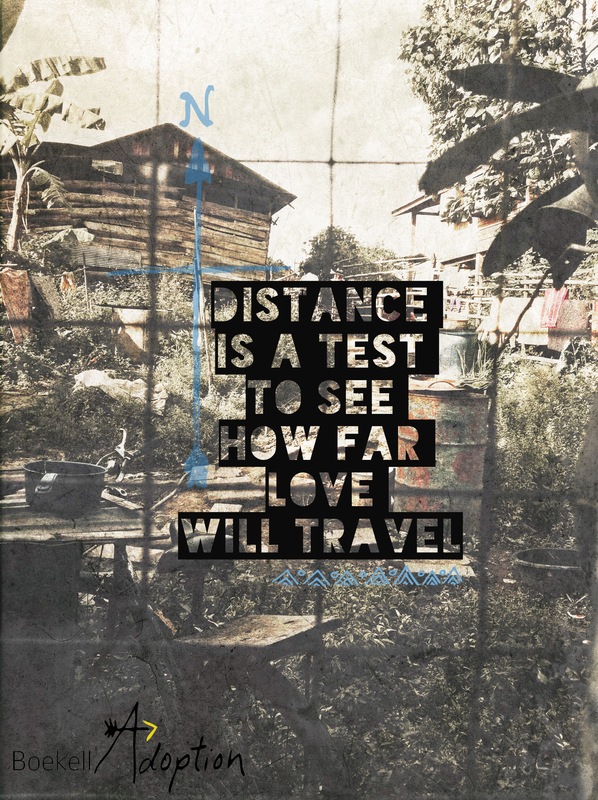 with love measured to infinity. numbered in the hundreds by my side. as home grown music sways my hips with you. as Grace entwines your beating heart to mine. 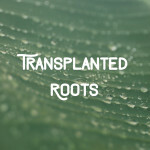 Transplanted roots bear fruits through pain. And all the nights yet lived. We’re Matched. We’re Waiting. We’re Hoping. (An Update). On September 30th, in the early afternoon, i found myself rushing home from the downtown building where our church gathers corporately and those of us on staff have make shift offices. i had been working when my bride called and told me a photograph was being emailed to her. We had potentially been matched with a girl in Uganda. No way! This wasn’t supposed to happen until sometime in mid or late 2016. That’s what we had been told to expect. But i would be hard pressed to tell you a single part of this adoption journey that has gone as we expected. When we switched from Colombia to Uganda (you can read about that here and here), we had asked how long until we would be matched and receive a referral. Based on what we had been told, we’d grown used to the idea of being matched towards the end of next summer (2016). That was about to change. My wife told me what to expect from the photograph, “The picture will not have her face in it, it will show her special need without showing her face.” If that didn’t send us running we could see the rest of the photos. I dropped everything and raced home… weeping and praying the entire way. She has a face, she has a name, and she has a future. It’s incredibly bright in spite of much. She has been seen by us. We’ll tell the story in detail one day, when much of the information is no longer private, but long story short, we saw the first photo and then the rest and we said yes. And that is how we got matched on September 30th. A match is not a referral, it is more like a “soft-referral”. It is like someone asking you, “would you be interested in adopting this specific child?” And if the answer is yes, they will get you the referral as soon as possible. We were matched. It was a beautiful day… a scary day… an unforgettable day. She has a face (we can’t show online), she has a name (we can’t say online), and she has a future. It’s incredibly bright in spite of much. She has been seen by us. The official referral: We are waiting on the official referral and this is everything, but a formality. It’s not a guarantee but the odds are almost 100% that the referral will come. And it will likely come very soon… like within weeks or even days. United States Citizenship and Immigration Services (USCIS) Approval: We have filed an Application for Advance Processing of Orphan Petition (sounds pretty official doesn’t it). USCIS normally takes 8-12 weeks to turn this around, but the process can sometimes be expedited for the extreme health concerns of an orphan. We strongly believe that the girl we have been matched with may qualify for the medical expedite. And so we wait. The future in still very uncertain, but we know her face (i dreamed about her the other night). This makes the wait easier and harder… both at the same time. We’re striving to rest in God’s perfect timing. He is faithful and good. His timing is always perfect. We wait with hope. If we receive this referral, there are three possible scenarios moving forward. Scenario One: USCIS does not expedite the processing of our paperwork and we are not approved until December or later. The Ugandan government closes down from December 15 – January 15 and therefore, without expedited approval we would not travel until late January or early February. We would travel once for anywhere from 3-8 weeks. And we would bring her home. Scenario Two: USCIS expedites the paperwork and we travel in November for our court date. At this court date we will hopefully be granted legal custody of our daughter. And we would wait for Ugandan officials to provide her passport and clear her for exit. The Holiday season (December 15 – January 15) would most likely stall this process for no less than a month. In this scenario we would then leave Uganda and our daughter behind while we wait. We would then return after the Holiday when the processing of her exit requirements was completed. Then we would bring our daughter home. …it is not even in the realm of possibility in all reality… but this would not be the first time God had pulled off something impossible. Scenario Three: This final scenario is the most impossible of them all and for that reason, i am praying towards this end. Again, the likelihood of this scenario is almost zero. The scenario goes like this… We get USCIS approval and our referral ASAP… like early November. We get a court date in Uganda and we board the plane towards African soil. We receive custody of our daughter without any hesitations and because of her medical needs, the Ugandan officials in charge of processing her exit requirements push everything through before the Holiday and we bring her home before Christmas! Pray that this happens. Again, it is not even in the realm of possibility in all reality… but this would not be the first time God had pulled off something impossible. 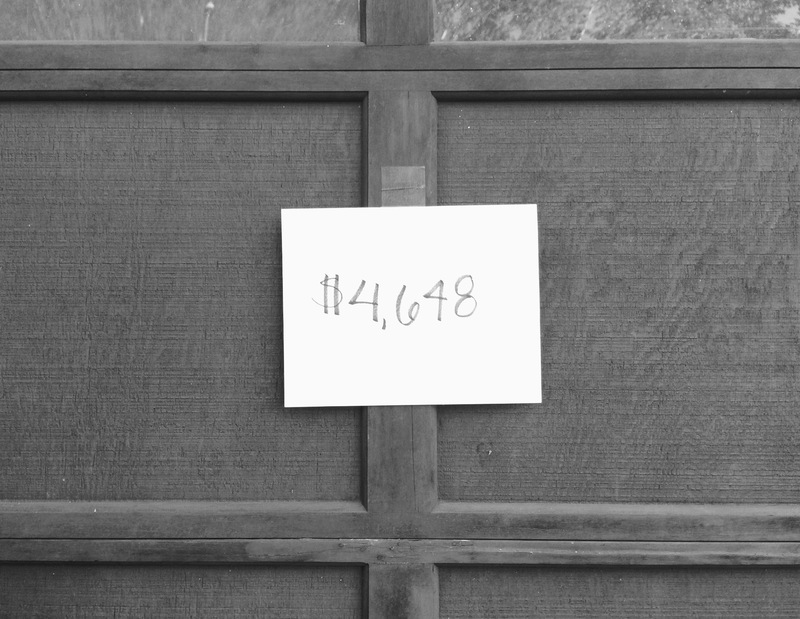 So many of you have already joined us in this journey and we are so deeply thankful. It’s been an honor and a joy to have so many of you walk with us. Our need has grown slightly from $41,000 to $46,000 because of some extra fees during the switch from Colombia to Uganda and because of extended travel requirements. 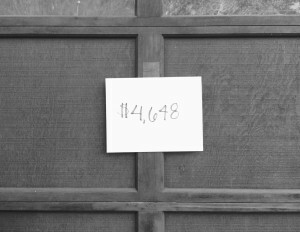 Currently we are about $11,000 away from this goal. We expect to receive several grants that will hopefully cover a chunk of this, but we still have lots of ground to cover financially. Add to this the crazy details of this journey and the twists and turns that it has taken and just to be frank, the team of people fighting for this girl cannot possibly grow too large. She already has armies of people fighting for her and we’re inviting even more to join us. Here are some ways you can join us in this adoption journey. 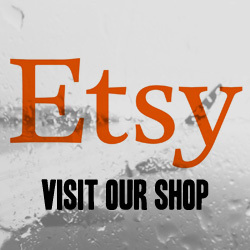 ETSY: We have an ETSY shop full of original and re-purposed art. We made some and our friends made some and people we barely know have made some. You can shop that store by clicking here and every single penny of the profit will go to fund our adoption journey. You can also get in contact with us about donating art to the shop, if you are so inclined. 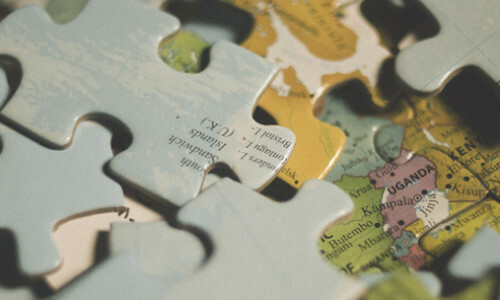 Puzzle Pieces: You can read all about the puzzle fundrasier here, but basically we are putting a puzzle map of the world together for our daughter’s room and on the back of each puzzle piece will be tons of names… names of people who helped bring her home. The puzzle pieces are $20 each and if you purchase one (in our ETSY shop or in person) we’ll put your name on the back of that piece and she will know that you were a part of this story. Email List: You can sign up for our email list by clicking here and as we get closer to traveling it might just become a more frequently used method of communication for our journey. Pray: Every day it becomes more and more clear that we are being and will be stretched beyond anything we are capable of in this journey. Pray that God’s strength will be made perfect in our weakness and His glory will be made known to all who see. And please join us in praying specifically for Scenario Three listed above. Share: Help us out on social media by sharing our posts and linking to our stuff. This has been the number one way for us to connect to new people in this adoption journey. Please share and share again. Get Creative: If you have any other ideas for how you can join this story of love and adoption…. please contact us and let us know. We’re open for any suggestions and would welcome your ideas with deep gratitude. Let’s get this little lady home! This is a story about dashed expectations and changing plans. A story of transitions. This is a story about fear, pain, Love, doubt, and Hope. It’s a story about Africa. It’s a story about me and about you. A story about a girl. i didn’t write this story, i never could have written it and even if i could, i never would have written it. It was written by Someone else. i’m just going to tell it to you, as best i know how. That Time We Said No To Africa. (Fear). i was never a fan of spending a long time in Africa. i’ve always wanted to travel to Africa… Just a quick trip with some photographs to show the family and friends back at home so they know how adventurous i am and how i am globally minded and compassionate. An African Facebook profile pic would be worth a week or so in Africa. 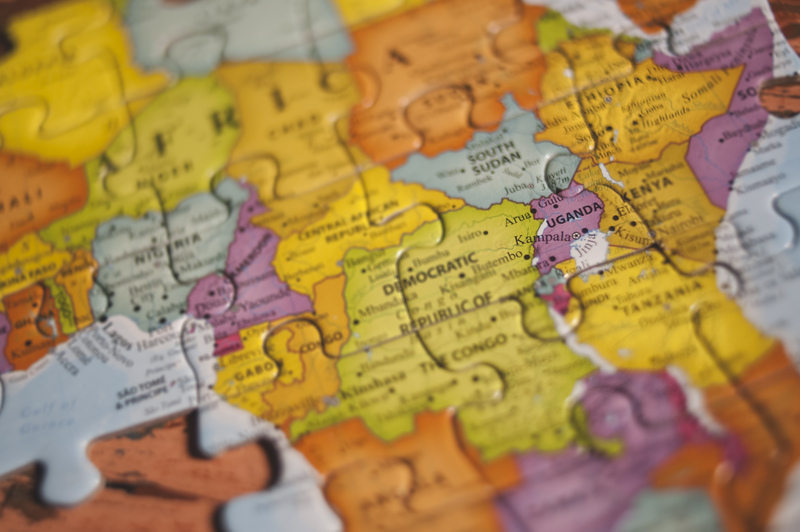 But as we began praying about the country we would pursue adoption through, Africa didn’t make the cut. Adoption had been in the plans since as long as marriage had been in the plans but where from… We didn’t know. Africa had always been in the “plans”, too. The “we should go to Africa sometime” kind of plans. After all, “we should go to Africa sometime” right?! So, come late 2014 and into early 2015 we started praying about adoption (as a right now kind of thing). We started consulting friends and family about what it would look like for us to peruse this adoption journey NOW. We started researching adoption agencies, programs, and available countries. And when we looked at countries, we started in Africa… After all, “we should go to Africa sometime” right?! Nope. Not going. Ain’t happening. Every adoption program comes with a list of stats and expectations. It’s kinda like the back of a baseball card merged with a cookbook. And one of those things on the expectations list is always: expected time in country. We looked at Africa first and not only were there very few programs in Africa, but the expected time in country wasn’t listed in days. It was listed in weeks. But even that was misleading. They could just as easily used the word months. The first African country our hearts sprang to was Uganda. Not only would it be “nice to travel to Africa someday”, but some of the favorite and most hip and white social justice heroes of my high school and early childhood days had started their work on Uganda. Invisible Children had captured my attention during my late teens and early twenties in their work to bring awareness to the child soldiering and night traveling plights of the young people in northern Uganda. Noonday was cranking out fair trade jewelry in Kampala. And on and on the list could go. Uganda was the place to go if you wanted to save the world. So, my finger landed on Uganda and slid down to time expected in country… 6-8 weeks. Nope. Not happening. Forget about it. You see, i’m already a father of three, and they’re not traveling to Uganda with us, and i’m not leaving them here for 6-8 weeks while we’re in Africa. Uganda is fairly safe today, but 6-8 weeks in Uganda is like two years in a “normal country”. A lot can happen in Africa in 6-8 weeks. i didn’t write this story, i never could have written it and even if i could, i never would have written it. It was written by Someone else. i’m just going to tell it to you, as best i know how. i mean haven’t you ever heard of Al-Shabaab? Or of the LRA? i wouldn’t want to be in Africa long enough to meet Joseph Kony in a back alley (6 years ago i would have, but being a father has brought back the fear). i mean haven’t you ever seen the movie Hotel Rwanda? Political landscapes can flip at the drop of a hat. Ever heard of Burundi? Neither had i until a short while back when they had a government shift and the Department of State issued a shelter in place for all Americans there until airports could reopen. Stop it. I could throw a rock into Burundi from Uganda. And i sure as heck don’t want to be caught in the crossfire when Leonardo DiCaprio is trying to smuggle blood diamonds out of the country. My father-in-law lived in Africa for a while and he had to carry a big stick when he went to town and watch for pickpockets in the reflections of store front windows. Several of my friends spent much of their childhood in Africa. Where one of their dads planted a church. The kind of church where pastoral visits sometimes require a car trunk full of weapons. We’re not talking machine gun preacher, i promise. It didn’t go down like that. But while we’re on that topic… Have you ever seen the movie Machine Gun Preacher? It’s pretty intense in South Sudan and i could throw a rock into South Sudan from Uganda. You see, when they make movies about Africa they don’t have to write a script of political upheaval and extreme violence and turmoil and sickness. History already wrote the script. And what about all the sickness?! i wouldn’t want to be in Africa long enough to get AIDS or Ebola. And thank God for malaria shots. What if i am killed by a hippo?! Those guys are fierce. Have you ever read a travel advisory for Uganda? Not very comforting, to say the least. When Dreams Die in a Swimming Pool. (Pain). It was the day before my birthday, and we were on vacation in Myrtle Beach, SC. 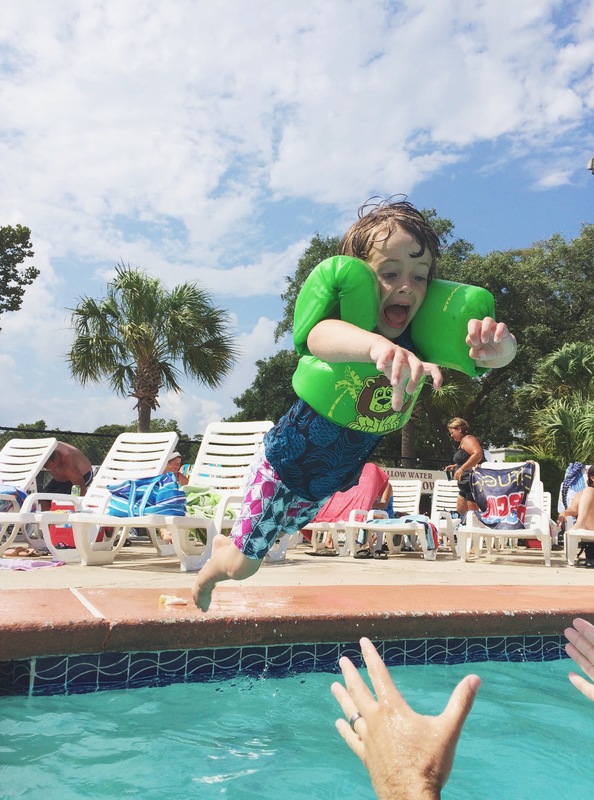 i was in the pool with my boys, and they were jumping fearlessly from the deck into my arms. They weren’t thinking about the water that was taller than their heads or the fact that the distance between me and them was the actual limit of their jumping abilities. They were thinking about the joy that came with saying “risk be damned,” and they were just jumping. They were thinking about the strength and consistency of their loving father’s arms, and they were just jumping. They were thinking about their joy and my joy, and they were just jumping. i should have known that as i was basking in the presence of such amazing child-like faith and joy… That God was about to test my faith and make war for my joy… But i never saw it coming. “We have to talk”, Sarah Beth had just returned to the pool area, and, in hindsight, you could read it on her face. She got into the pool and walked over and then she spoke, “the agency called.” My first thought: “we have a referral!”. Her first words, “They’re shutting down the in country hosting program in Colombia.” Wham! My first response was frustration (didn’t they know we were on vacation?!). And then everything just blanked. As Ezra crashed into the side of my head, and i barely managed to catch him and keep him from sinking into the water, i didn’t even look at him. i just stared into the sky above the fence on the west side of the pool area and felt my stomach turn to mush. The pilot program we were a part of in Colombia was the only thing that made adoption from Colombia work for our family’s current situation, and the end of the program would mean the end of Colombia. And i didn’t even have to talk it through (we did anyway), because i knew Colombia was being erased from our future, and i couldn’t find any words. i remember half-heartedly hugging my bride and telling her everything was going to be okay. But she wasn’t falling for it, and i wasn’t either. And when i said the next words, “God has a plan that’s better than our plan…”. It might have sounded like i was comfortable with that, but my soul was laced with bitterness and frustration and confusion. “Can we talk about this later?! Let’s just enjoy the children that we already do have, and we can talk about this later.” And then i went about pretending like i was enjoying myself, but all i could do was stare at the sky above the west side fence of that pool area. i felt like i had just been kicked in the stomach. They were thinking about their joy and my joy, and they were just jumping. When we were informed that the specific Colombian program we were a part of was being shut down, the agency told us they were putting us in contact with the Haitian/African Program Director. This was white noise to me for about 48 hours. i was reeling and frustrated and in a complete fog. i felt like we had lost our daughter. We’d yet to get a referral so there was not a real life little lady to match that unquenchable belief that we had a daughter in Colombia, but it had felt so real to me. Now the pain of loss felt real, too. i felt like she was dead. She wasn’t. But the expectations were shattered. We had been so confident. We believed we had a daughter in Colombia. We didn’t. And we likely never would. Just. Like. That. We ate at Bonefish Grill that night. It was date night, and we tried about five really nice local restaurants first, but i refused to wait in line at any of them and 1.5 hours later we ended up at the stupid Bonefish Grill (actually a really nice restaurant, but it is a chain, and i wasn’t in the mood). It was depressing. It was surreal. It was like the twilight zone. i was angry. i was mean. Sarah Beth was hurting already. i hurt her even more. i said, “It’s MY birthday tomorrow…” as if that made it alright for me to be a self-centered piece of crap. i apologized. She wept. Right there in the Bonefish Grill. The waiter was awkward. The cloth napkin was streaked with mascara. i ate a steak. i was grateful for delicious food and a patient wife, but i’ve never felt so weird eating food. To be in a nice restaurant with romantic lighting, just going through the motions because, “Hey! No retreat! Always advance!” i was determined to enjoy this vacation, but i was fooling myself. My heart was broken. i cried when i was alone, and i pushed the vacation forward when i wasn’t. i’ll always wonder if i should have pushed so hard to salvage that day instead of just absorbing the blow full force, but it’s in the past now. And i can tell you this, i’m not eating at Bonefish Grill ever again until our daughter is with us, and you can take that to the bank. i’ll eat a steak again and this time i won’t weep in private. i won’t care who sees my tears. It was painful. The wound was deep, but it was healing faster than i thought it would. And it wouldn’t take long for the smoke to begin clearing. We were mourning expectations and not an actual person, and so we moved through the stages of grief a little faster. It was painful. The wound was deep, but it was healing faster than i thought it would. By the last days of our vacation we were seriously thinking a lot about Africa. As i previously mentioned, when the Colombian Program Director had given us the heartbreaking news about the closing program, she had mentioned the African/Haiti Program Director would be contacting us. This was of little comfort to us on August 6th, but after about 48-72 hours it was starting to get into our heads. Into our hearts. 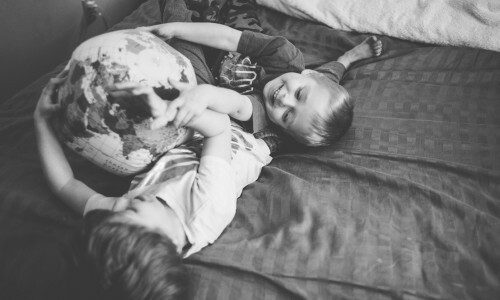 After all, “we should go to Africa someday.” This was the first place our hearts had flown to at the start our adoption journey, but it just didn’t seem like it fit. Now we were asking all the same questions about if it fits now. I’ll be honest, the questions seemed even harder this time. Maybe it was how comfortable we had become with the idea of Colombia, but all the questions we had asked about Africa in the beginning, seemed even heavier now than ever. Everything that had led us to say “no” to Africa in the first place, was still true. And i was still scared of the idea. More. Than. Ever. Even when i would rather walk in the “less than”, He is good to lead me to walk in the “better than”. My initial response was the same as before, “No way. Not going to happen.” But God has a loving history of turning my staunch and confident “no” into a humble and reliant “yes”. i’ve said “no” before only to later hear God so kindly say, “we’ll see about that.” He makes known to me the pathway of life. Even when i would rather walk in the “less than”, He is good to lead me to walk in the “better than”. We’re going to Africa. (Transition). As we were wrestling with these questions, fears, and hesitations about Africa, we learned that the lady from our agency, answering so many of our questions about Africa, was directly across the street from where we were staying (remember the day in the pool). God whispered, “I’ve got this.” We talked about Africa all the way home on the long drive back from the beach. The other African programs didn’t fit like Uganda, so if we switched to Africa, it would most likely be Uganda. But could this really be where our daughter is? We were getting close to sure by the time we got home, but i wanted to talk to some friends and family. Some folks who i trust to love me honestly and authentically. To be away from my boys for that long, in a place like Uganda… it seamed foolish. Risky. Stupid. Was it worth it? i was beginning to believe Him. i talked more with Sarah Beth. We prayed. We talked about pros and cons and fears and excitements. We prayed. i talked to my dearest trusted people. They prayed. We prayed. i was still scared. To be away from my boys for that long, in a place like Uganda… it seamed foolish. Risky. Stupid. Was it worth it? i just couldn’t bring myself to believe that it was. God took His blowtorch of grace out and started melting my heart at the speed of light. There are about 5 things in this life that grip me to the core of my soul. 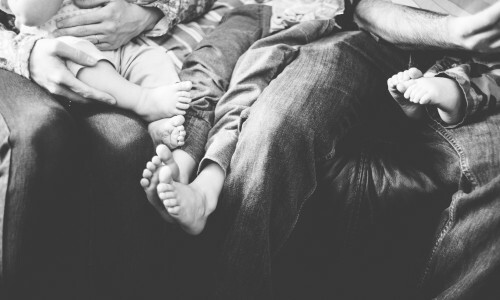 The gospel, my bride, my boys, adoption, and the church/church planting. When Jesus builds His church through church planting, it makes my heart go crazy with joy. So, i pulled up the website for Sojourn Church Uganda and started reading and watching. And God took His blowtorch of grace out and started melting my heart at the speed of light. The pastor was from the states, and he packed up his entire family, even his kids, and planted a church in a slum in Kampala. God had me by both sides of my face now, “I NEVER abandon my kids, son! Nothing! Nothing can separate you from my love. Risk is right. Fear not my child!” i wept!!! The world shrank. Uganda seamed like it was only about two miles away… like i could walk there. i saw the faces. i saw my brothers and sisters. i saw Ugandans and Americans and Ukrainians. i saw the church. i saw God saving people and loving His kids. All in the heart of Kampala. i finally saw what my friends who have visited Uganda had been saying all along. This is one of the most beautiful places on the planet. So much love. And for the briefest second… i saw my daughter in Uganda. My heart saw her. i wept. And i wept. It was the epitome of ugly crying. My heart was a puddle. As soft as it has ever been. Fear was dead. Hope was alive. We’re going to Africa. We’re going to Uganda. That’s where she is. And we’re going to bring her home. Risk be damned. Fear meet love. Enter joy. Are we doing the right thing? (Doubt). But wait. It can’t just flip on a switch like that, can it?! As the clouds of fear were breaking up another storm was forming on the horizon. The storm of doubt. What about unethical adoption?! Is that even a thing? Oh, it most certainly is and Uganda (and other African countries) has some stories to tell about it. Is it frequent? Not necessarily. Does it happen enough to draw the attention of many? Yes. And then doubt hit our hearts like a two-ton truck. An article here. A blog post there. This family thought their daughter was coming back from the states when she turned 18, but they were lied to. That family had to leave the village for medical attention, and while they were gone the folks they trusted with their son ditched him at the orphanage. And what about the plethora of orphans who could be cared for by their own parents if it was not for severe poverty. What do we do with that?! Ever heard terms like double orphan or evangelical trafficking? These are terms that make you think. These are ideas that make your head hurt. Some of what you read and see has just enough reality in it to make all the other crap they’re feeding you sound true and some of it is just undeniably true. Children come into adoption through painful and sometimes very complicated situations. Each situation is unique and beautiful and brutal. There is so much more to write about this and one day we will, but for now be aware of this: adoption is born in varying levels of tragedy, but no adoption is ever born without tragedy. Children come into adoption through painful and sometimes very complicated situations. Each situation is unique and beautiful and brutal. But SOMEtimes adoption is riddled with lies and theft and is nothing short of trafficking and profiteering. Adoptive families must take responsibility for these things and pursue ethical adoption to the furthest degree possible. But still the thought of an unethical adoption resulting in the growth of your own family is incredibly hard to process. International adoption is full of difficult thoughts that lead to doubt. 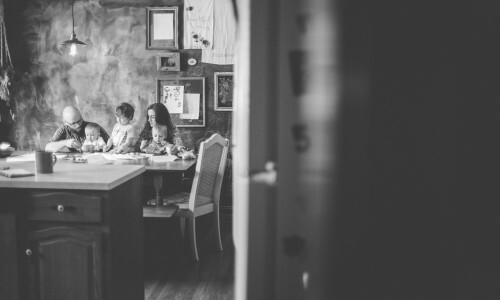 In many countries, international adoption has been shut down because of these previously mentioned reasons, and there has been very small pockets of chatter in Uganda about the same. It’s not likely, but still, what if we get 8 months into this thing and Uganda shuts it all down? Then what? International adoption is full of uncertainty that leads to doubt. We’d considered these things throughout the entire process of this adoption, but with the proposed switch to Uganda, Pandora’s box had been opened once again. For days and days we wrestled with these thoughts and doubts and questions and ideas and realities. Are we doing the right thing? Your brain short-circuits a little bit at times like these. And doubt and fear have a way of making the heart feel numb to even the most exciting things. We talked to our agency, we googled, we read, we prayed, we watched, we talked to friends, we prayed, we talked to each other, we read the Psalms, and we prayed some more. Are we doing the right thing? Your brain short-circuits a little bit at times like these. And doubt and fear have a way of making the heart feel numb to even the most exciting things. And it comes down to this, One, there are orphans in Uganda. Orphans for whom international adoption is their only practical, authentic, and realistic hope. These orphans need forever families. Two, there are orphans in Uganda who wouldn’t be orphans if someone could come alongside their parent(s) and help them find or develop a sustainable source of provision for their family. Three, our agency goes above and beyond what is required of them by Ugandan law to insure the absolute ethical nature of the adoptions they facilitate and that these orphans are in need of forever families. Four, and superseding all other reasons, God is all powerful and completely sovereign. We trust Him. We long to trust Him more. And we can move forward through doubt and fear, knowing His love never fails, and His plans are always best. And so that’s where we find ourselves. We’re heading to Uganda. We’re moving through the fear and the doubt. We believe we have a daughter in Uganda. Even more importantly, we believe that God has already written this story that we are living in real time. His love is infinite. His plans are better. His joy is full. And His heart is for the orphan. So, fear still fights, but its end is sure. And doubt still lingers, but it will meet its demise. We’re setting sail for Uganda, but our course has already been charted. Through still waters and dark waters and wild waters we will go. And our God continues to remind us that because He is good, risk can be right. This is still our story. This is still her story. This is still your story. And this is still His story. This is Africa (TIA). But she was never anything more than a concept. We never had a daughter in Colombia. She wasn’t there. If you have been following along with our adoption journey on social media (and thank you, if so), you probably read our latest update in which we announced we would not longer be pursuing an adoption from Colombia. Essentially, while we were on vacation, we received word from our agency that the specific pilot program we were signed up with in Colombia was going to be terminated. Just to be clear, Colombian adoptions are still ongoing, just not the program we were enrolled in (I will gladly explain the whole situation in detail to anyone who might be interested). I initially dealt with some pretty intense feelings of disappointment, deep confusion, and uncomfortable restlessness. And, honestly, embarrassment. I felt naive and foolish in my confidence. I boldly proclaimed that I believed we had a daughter in Colombia (of course, even then I acknowledged the uncertainty of it while simultaneously believing it was an actuality). I was learning Spanish. I put a map of Colombia on the wall near my side of the bed, and I would look at it periodically wondering where she might be at any given moment. And then, just like that, she vanished. But she was never anything more than a concept. We never had a daughter in Colombia. God has stirred our affections for and fixed our eyes upon a “new” international adoption destination some 7,348 miles away from the original…UGANDA. We spent the remainder of our vacation non-committed to any particular decision except that we were going to soak up our fleeting time together. Understandably, this unexpected turn of events prompted us to pray for direction while diligently researching possible alternatives and reaching out for advice/guidance from those we trust. And our hearts kept turning over for Africa . Africa, after all, is where my heart originally resided in the beginning of this crazy adoption adventure, but once presented with just how seemingly “perfect” the Colombian option was, we moved forward with South America. Not having ever been to Africa (or even close), this seemed/seems particularly unfamiliar and frightening – the distance, the potential instability, the unknowns. But, basically, we prayed for guidance and discernment, and we feel the Lord provided. We are very drawn to and extremely excited about this big leap. 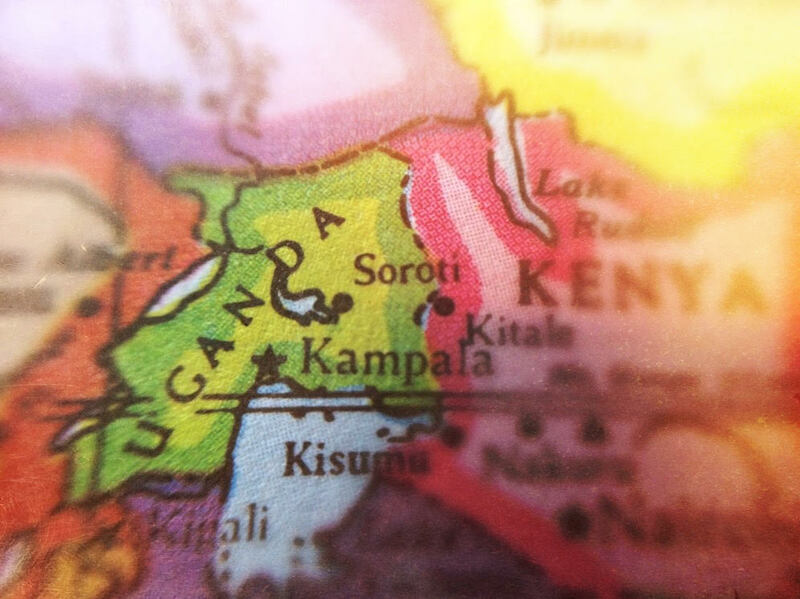 God has stirred our affections for and fixed our eyes upon a “new” international adoption destination some 7,348 miles away from the original…UGANDA. And now, my heart is hungry for everything Uganda. We are absorbing all we can about this beautiful place, saturating ourselves totally. He’s turned my sorrow into dancing. And now we move forward. Expectantly and excitedly. We are relinquishing what control we thought we had. 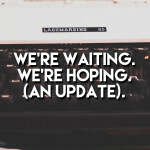 We are eager and anticipating whatever God has planned. We can rejoice. We can be thankful. He even worked it out that we would lose minimal time and finances in the paperwork process (He didn’t have to). A fairly smooth transition. And after having digested all of this, my prideful heart in admitting I was mistaken about our family geography has dissolved. I don’t feel any regret for embracing Colombia and attaching myself there. So many doors opened. So much was learned. Our hearts were softened so uniquely. Our faith was increased dramatically. And now we move forward. Expectantly and excitedly. We are relinquishing what control we somehow still thought we had. We are eager and anticipating whatever God has planned. I have no predictions. And honestly, if we came out of this adoption process daughter-less, He is still so, so good. His timing is perfect. His plans cannot be thwarted. I can be confident. And this was His plan all along, not some back up on the fly. We are living out His Plan A. Who Will Be Next To Join The Story? A very dear family, who we have worked with while photographing weddings locally (they do video production…obviously), has put together a video about our adoption story. Check it out. As always, their work is better than excellent (you should hire them if you have video needs) and we’re pretty fond of the story as well. Enjoy. In His goodness & in His perfect timing – He made it pour. And, as always, it was unstoppable. 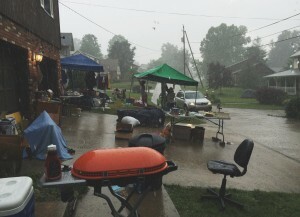 A month ago, almost, we had what I would consider to be a very successful fundraising yard sale to benefit our adoption. Honestly, the whole experience (and I say experience specifically) left me speechless. But I believe words are required. Basically, He made it rain. The whole production was laden with abundant blessing. We were lavished with donations. By the truckload. 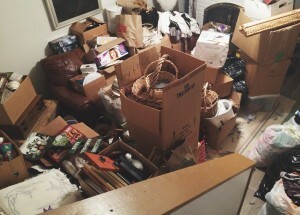 Our two car garage, den, studio, and attic were mounding with things. People were so gracious to us. I hope one day our daughter can understand how deeply her family and friends wanted her here. 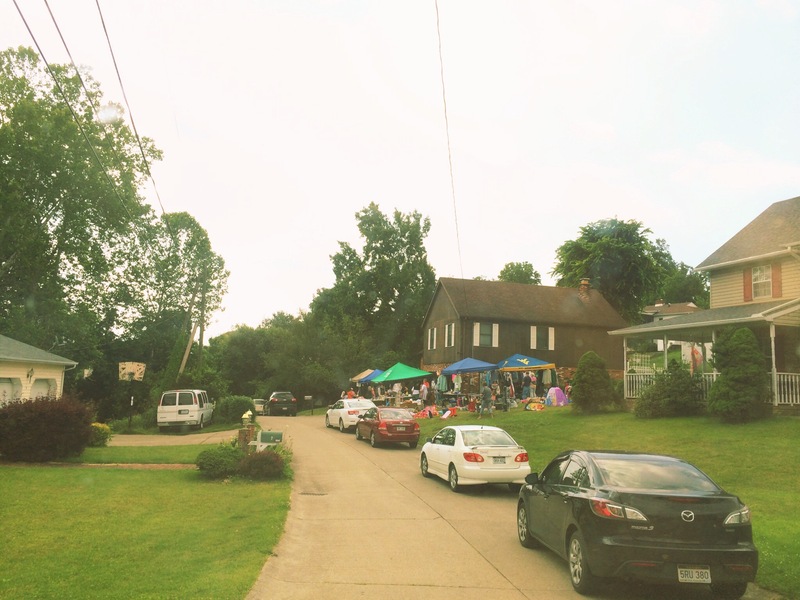 I hope baby girl knows people lined up to shop her fundraiser. I hope she knows we worked hard to make this fundraiser successful. And also that there are other people who love her that worked harder still. But He pulled it off. No one else could. But there were so many other magnificently simple and profound unexpecteds. The friends who volunteered their help because they “love yard sales” (love us). Our neighbors’ kiddos who cheerfully brought over their piggy bank money without prompting. The generous family who bought a couple 25 cent toys and handed us a $100 bill (there were many of those families). The little girl who said so sweetly that she was praying for our daughter. The woman who hugs the handsome boy beside her as she says, “We got our first grandson through adoption.” The message we received from a woman about a revival of Joy swelling in her heart. The man who proclaimed “I was adopted” before he donated to our own adoption. Even the little finds that were found when sorting through the donations, things that were just what so-&-so was looking for. I was hoping for $2,000. Which was made by noon the first day. And the kindest lady (let’s call her “Jillian”) you could imagine stopping by to purchase donations for the multitude of charities she’s involved with. Her number is now saved in my phone. She’s already brought us over brownies. And the professional organizer who literally knocked on our door the week of volunteering her time. We had never met before. She dominated. So thankful for her. Beyond words. Strangers forging a team to rally for a daughter we don’t yet know. Our bones ached from constant motion. There was fellowship. And celebration. We were living. I still haven’t gotten to the best part. I surely will weep (again) just at the thought. Saturday afternoon we were sitting in the heat just hoping the rain would pass right by, maybe close enough that we could catch a breeze. There was a light mist, a drizzle. We rejoiced at the relief, and I casually started covering up the tables with small tarps. The rain picked up. People started shuffling to keep dry (except one father and daughter who got caught up in the moment). Then it came down, full force. And just. Kept. Coming. There weren’t enough tarps. 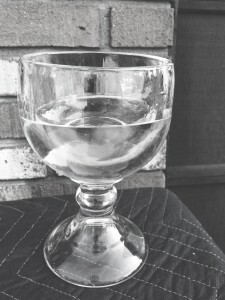 The cups left uncovered experienced fullness. The tents covering up the donated clothing and toys began to buckle. And break. A handful of true blues (and completely kind strangers) were stranded trying to hold it together. All soaked. And there was so much joy. Real joy. Real laughter. Real appreciation. He made it rain. And once it was all semi-cleaned up, we counted the money. We could have easily made more if it hadn’t rained when it did. But gathered around our living room, soggy and exhausted (but yet not at all), counting what was raised…the excitement couldn’t have been any bigger. All soaked. And there was so much joy. Real joy. Real laughter. Real appreciation. He made it rain. Those two days were packed. If I wasn’t promoting on social media, my “feeds” went unfed; they were not habitually scrolled through (and the world kept turning). Our bones ached from constant motion. There was fellowship. And celebration. We were living. Not something I would have imagined resulting from rummage. But this adoption has been strewn with hidden pockets of goodness. Affirmation. When it’s time, you sweat. You get that sunburn. You throw your hands up in the rain. You meet your neighbors. You graciously accept your free coffee (and thoughtfully delivered dinner). You give that dollhouse away for a steal because those little girls see it. You pick up those underwear that somehow got mixed in with the sweaters. You praise the treasures found and presented to you by sweet little old ladies. You worship under that tent. You feel those drops. You see what cannot be seen. Basically, He made it rain. If you donated to our sale, thank you. If you shopped our sale, thank you. If you threw on an apron and haggled with the best of them, thank you. 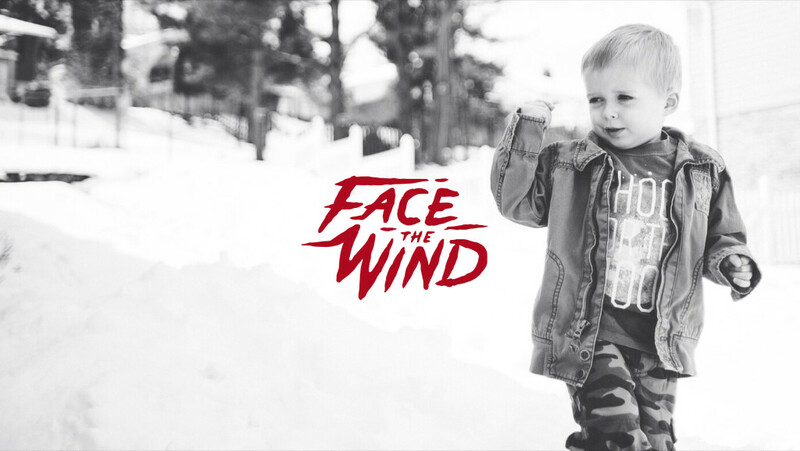 If you watched our kids, thank you (thank you!). If you promoted our fundraiser, thank you. If you prayed for us, thank you. If you, in any way contributed, thank you. Do I expect every fundraiser to turn out so amazingly? Nope. But they could. And this one was beautiful. Happy West Virginia Day! 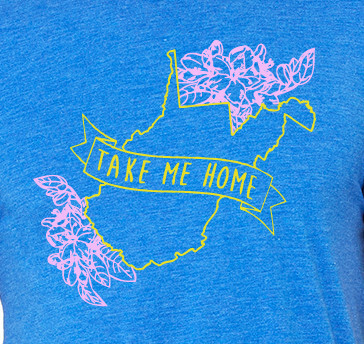 The Mountain State turned 152 on June 20th and to celebrate we are releasing a special t-shirt. Home. As our beloved daughter, this beautiful state will become her new home. She will grow roots here. She’ll taste the sunshine and chase the fog. She’ll experience white winters and blazing autumns. She’ll find summertime lakes and wild flowers and county roads. She wasn’t born here, but this will be her home. Here. With us. 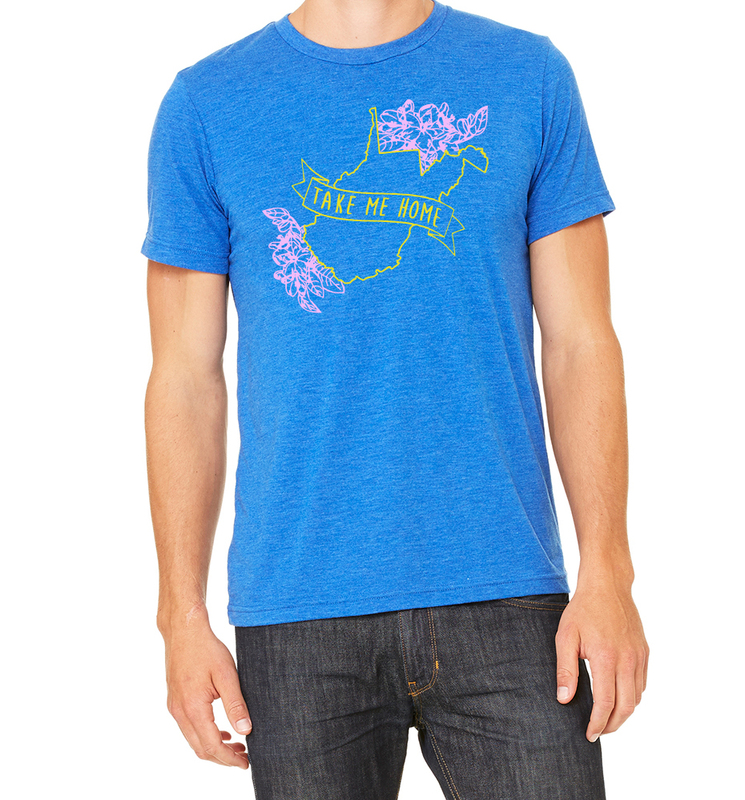 All the profit from these shirts will go to help us help us take our little señorita home on down a country road! The shirts are soft and vintage looking and are sure to become one of your go-to articles of clothing (toddler and infant shirts are slightly different in shade and not as vintage looking). All shirts in all sizes are $25 each. Thank you so much for your love and support! I’m scared. I am literally afraid. Fear and anxiety are not brand new feelings for me, but they are overwhelming me more than ever before. The chair in my study will soon be stained from all the tears I cry with my face buried in its lime green upholstery. I’ve been scared before but I’ve never been this scared and certainly not with this much frequency. Life has never been this busy. It has never been this tiring. The stakes have never been this high. And I look in the mirror at a desperate man. Ten years ago when people described to me what it meant to feel anxiety and debilitating fear, I just nodded my head as if I understood. They would speak of shortness of breath and increased heartbeat and knots in the stomach. They would speak of feeling paralyzed or exhausted or hopeless. People would explain to me how fear and anxiety can grip the very depths of your soul and literally impact your body and I just didn’t get it. I had sympathy and no problem believing it was real, but I couldn’t grasp it. Then I started my own photography business, married the love of my life, and soon after we were pregnant with our first boy. This all happened in a span of less than 4 years. Suddenly I knew what it meant to feel anxiety. If you’ve ever looked at a fledgling photography business’s profit & loss statement, you might begin to understand. 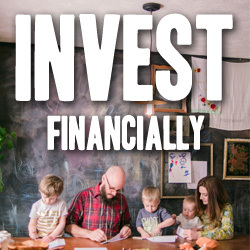 Now imagine looking at the profit & loss statement at the end of a 70 hour work week, knowing that your pregnant wife is waiting for you in the downstairs of your gracious mother-in-law’s house, which is your own temporary home. And no matter how you crunch the numbers, they don’t add up to comfortable or anything within shouting distance of that place. That’s when I felt it for the first time. That’s when I curled up in a ball in the middle of my photography studio in Barboursville and wept and shook with anxiousness I had never known. My heart was racing. I couldn’t breath. My stomach was in knots and my prayers were desperate! And we made it through. God was faithful even when I wasn’t. He slapped me around a little bit in His mercy. My wife was patient, strong, gracious, and forgiving. We moved into our own home. Isaiah was born. The business accelerated. We made it through. But for a season I battled fear and anxiety on a daily basis. And it scares me, because I know I don’t have what it takes. It has struck again several times over the years. As I grow older I am faced more frequently with my inadequacies as a man, as a husband, as a father, as a pastor, as a bread-winner, as a photographer, as a friend, as a strawberry grower, as a golfer, as a pancake flipper… and now as an adoptive parent-to-be. And it scares me, because I know I don’t have what it takes. And when you fast forward to now: loving bride, three wonderful little men in the house, a steady and healthy (not huge but healthy) income with a little over a hair’s width of padding, a nicer-than-needed home, job security, food on the table, etc. And now we’ve started the adoption process. Fundraising is going gangbusters, people are pouring out unimaginable amounts of help and encouragement, and everything seems to be falling into place with a fair amount of ease and perfection. You would look at the circumstances and situations surrounding me and think that fear and anxiety would be the last emotions threatening to steal my joy. And I have never been so scared in my entire life. Weekly… at least, and often times, several times a week, I find myself struggling to breath… heart racing, face hot, stomach churning… Scared. Out . Of. My. Mind! You would look at the circumstances and situations surrounding me and think that fear and anxiety would be the last emotions threatening to steal my joy. Listen, all the things I thought would calm my fears and squelch my anxiety feel like sand slipping through my fingers. It all feels so fragile and temporary (it is). And everything about the “man that I have become” that I thought would destroy fright and vanquish doubt isn’t enough. I have nothing left to give. This is all of me. And all of me adds up to inadequate. Grossly inadequate. And that lime green chair in my study is getting a workout and a saline bath on the regular. The tears are hot and the prayers are desperate. And so I run to Him. I believe that the stories are true. I believe that barren women conceive and that water comes out of rocks and sea’s can be parted. I literally and as a combined result of logic, reason, and faith (all God’s gracious gift), believe that the sun can stand still and dead people can come back to life and people named Saul can have their name changed to Paul and find themselves ready to die for the same message they once sought to kill. I trust Him more than I trust myself. And He loves me more than I love myself. And so when I bury my face in the battlefield of that lime green chair, I cry out for eyes to see the promises and for peace to calm my troubled heart. He has already won the battle for my joy. For our family’s joy. He already wrote our story. Our daughter’s story. The final chapter is infinite joy. Adoption was His idea to begin with. We’re in good hands. And when I bury my face in that green chair later this week, I’ll be desperate to remember that. You’ll call her “mom”. Maybe “mamma” at first. Maybe “mommy” or like your oldest brother, maybe you will call her “mom-mom”. And i can promise you this, she’ll hear you. She already does. She’ll wake from sleep and hold you in her arms. She’ll stop to watch you spin across the living room. She’ll defend you from enemies. She’ll engage all your fears. She’ll share all your joys. She’ll read you one more page. She’ll meet your needs. She’ll take special note of your wants. She’ll find you. Pursue you. Embrace you. Educate you. Kiss you. Chase you. 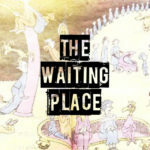 Wait for you. Cry with you. Help you. Feed you. Clothe you. Inspire you. Admire you. Miss you. Want you. Laugh with you. Trust you. Pray for you. Work for you. Fight for you. Live for you. If need be die for you… She will love you… She already loves you! Happy Mother’s Day to a woman that does not share your DNA, but loves you more than life or blood or biology could ever explain. You don’t know it yet, but your mother has a place in her heart for you that is bigger than you can grasp. A hope that is indestructible. A love that defies logic. You’re going to love her. She’s more loving than words can say. She’s creative. She sees beauty everywhere. She inspires a sense of wonder in life. She’s beautiful. Her eyes are peace. Her smile is flight. Her laugh is made of pure sugar. She’s smart. She’s side-splittingly funny. She’s courageous. She’s tender. She’s forgiving. She’s witty. She’s intoxicating. She’s gracious. She’s steady. She’s surprising. She’s more than words. She’s going to blow your mind and steal your heart. She’s your’s. She’s waiting. She loves you. Today I will wish her a Happy Mother’s Day on your behalf. And on a Mother’s Day in the not so distant future you will wish a Happy Mother’s Day to her yourself. Happy Mother’s Day to a woman that does not share your DNA, but loves you more than life or blood or biology could ever explain. You’ll be in good hands, my sweet lady. Mama knows how to love like the sun knows how to shine and the rain brings life to the spring. So come home soon… not to any set of walls… but to your mamma’s open arms. Her heart beats for you.